The province has launched mandatory Respect in the Workplace training for all government employees as part of a new partnership with Respect Group Inc. — a group dedicated to creating a global culture of respect. 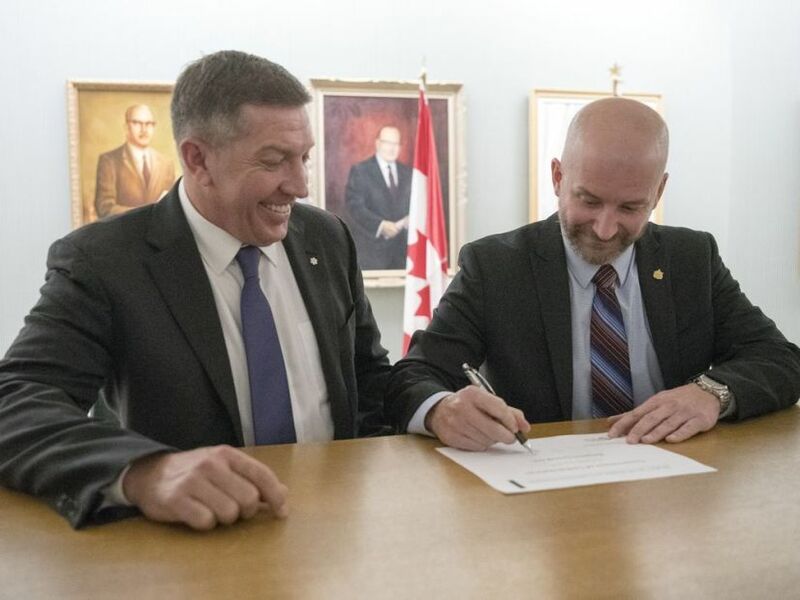 The announcement was made Monday afternoon, as former NHLer and Respect Group Inc. co-founder Sheldon Kennedy, and assistant chair of the Public Service Commission Greg Tuer, signed an agreement in front of a small crowd gathered at the Legislative Building on Monday afternoon. In 1997, Kennedy went public about more than 300 incidents of sexual abuse he suffered at the hands of Swift Current Broncos head coach Graham James over a five-year period. He co-founded Respect Group Inc. in 2004, which provides prevention training in sports, schools and the workplace. The program being provided to government employees is a 90-minute online training course which will be available for the next four years and includes modules on bullying, abuse, harassment, discrimination, mental health, managing emotions, transgender awareness, social media, recognizing and responding to incidents and signs and symptoms of workplace issues. Parks, Culture and Sport Minister Gene Makowsky helped make the announcement on behalf of Minister Responsible for the Public Service Commission, Ken Cheveldayoff. As much as the training is meant to educate those who may engage in workplace harassment, abuse, bullying or discrimination, it’s also for those who bear witness to it. Kennedy said the focus of the training is less on the incidents themselves than the impact they have on the individuals who are being abused, harassed, bullied or discriminated against. “It leads to depression, it leads to addiction, it leads to mental health issues, anxiety, the list goes on,” he said. He said the issues are also often misunderstood and hard to define, but believes Respect Group Inc. has found language that people can understand. As a pilot project, the Ministry of Corrections and Policing implemented the training in 2017. Makowsky said the Saskatchewan Public Service Commission will monitor the success of the program as the training gets rolled out for all government employees.